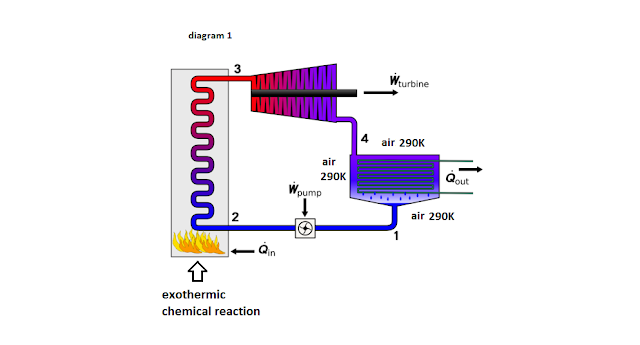 In current engines we use exothermic chemical reactions (chemical process that releases heat ) to heat the hot part, so that the heat of the environment to use for a cold part - Chart 1. I would venture to suggest that to using endothermic chemical reaction (chemical reaction in which the system absorbs energy from its surroundings) to cool the cold part, so that the heat of the environment to use to heat the hot part - Chart 2. Let working substance (γ) of the engine has a boiling point lower than the temperature of the environment - for example, γ is ammonia ( 240K bp). At ambient temperature 290K gases ammonia have 8MPa pressure and driven turbine (piston). To close the cycle will use an endothermic reaction between two substances α and β to the heat exchange with the gases ammonia, which will liquefy the low temperature caused by a chemical reaction. Let α and β are nitrogen and oxygen, such as by reacting with each other to give Nitrous oxide ( N2O ). This chemical reaction is related to the withdrawal of heat. Another option (why not essential?) Is α and β are solvent and solute (salts), in mixing that takes heat (endothermic solution). Guess - When solutions can probably achieve the best option - to crystallize by the heat of the environment? So we can repeat the process again with the same substances? Naturally – The unit and processes must be heat insulated from the environment. PS I am a supporter on the physical method with use of mechanical power (refrigerator) to obtain the cold in cold part. How nice it would be if we have any substances that are interconnected in endothermic reaction and the resulting chemical compound is unstable at ambient temperature! For example we use the chemical reaction between these substances to create a cold area with very low temperatures (to accept lower than 170K), and then after put out the resultant compound from thermal insulated cold part of the unit to the environment warm up in which disintegrate? The law of Lavoisier - Laplace collapse will be accompanied by heat, which we can use to heat the hot part of the unit / other unit. Or a catalyst to help the separation / reaction of the substances? So we can use the same amount of substances repeatedly to provide engine work - a renewable process so that the resulting mechanical energy of the unit will be 100% renewable sources. I will try to convince chemists that is worth working on. Yes, the idea of ​​cold part created by a chemical reaction is not new to me, but these days more and more solidified the idea that if there are appropriate substances, such unit will be useful in many cases even more than the aggregate with cold part created by physical methods. Probably chemical method will allow us smaller in size engines with more power . In the chemical method is likely to achieve greater temperature difference between the hot and cold part with less components - compressor dropped for example. Of course the comparison between the physical and chemical unit is possible olny in renewable chemical processes. Looking at chart 3 one might think that the work of such a unit is impossible. At first glance, here is nonsense - two substances are connected and disconnected by chemical reactions, and these two chemical process with the same quantities of materials give us useful mechanical energy ?? This is contrary to the laws of nature - This is so that we can create energy ?? - Impossible! In fact - the sum of the amounts of heat exchanged between the substances and the environment. Perhaps and you ask yourself - Why to use a chemical method once and it useful energy is formed by the heat exchange between a substance and environment as in physical method ? It should be chemical (assuming that we have renewable chemical processes) take advantage, because the warm part in this method can have a temperature higher than ambient temperature (while in physical strictly confined to the ambient temperature). It will shape a large temperature difference between the hot and cold side of the unit, respectively greater useful power. for useful mechanical energy expressed by the quantities of heat which substances exchange with the environment is wrong. Although I know that when it comes to converting heat into work before I have to express any statement on the matter have to think twice and still make mistakes to express an opinion without I have thought many times - I beg your pardon! 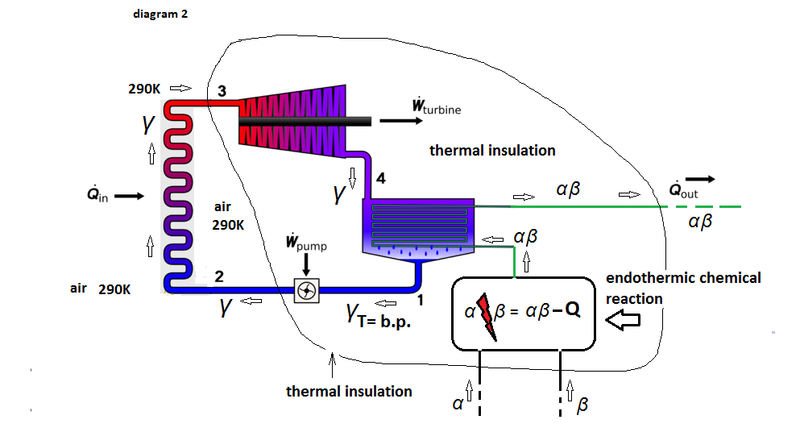 By the law conservation of energy: the sum of the mechanical energy produced by the converter on heat into mechanical energy Wturbine and Qout must be equal to amount of heat given from the environment on the compound / solution - Qin. Will compare unit with a dam and power plant. The thermal insulation of the engine is the sluice that barred the river. If we have a river / environment with a suitable temperature; and a turbine, to obtain mechanical energy than we should to dam the river / to insulated unit. The river will fill dam / should need more investment - to cool the cold part by external force ..... in both cases nature will do the rest. External combustion - internal cooling engine - This definition is probably not appropriate for the engine as this on chart 3, but the definition suggest to refine when we find a renewable chemical process. If you see Svetozar the... (I have not yet decided what) to advertise a theory - read! I hope that will be interesting and will not waste time in vain. Публикувано от Svetozar the Cold в 6:54 ч.